Finally! Darren from Gripping Beast promised these were coming "soon" at Vapnartak 2012. I'm glad he doesn't owe me money on those terms! Well, for my money these are well worth the wait. What do you get? Well, a stout box, with a set of assembly guidelines inside. The figures themselves are on eight identical sprues, each carrying five bodies. The bodies are moulded with the shield arm in place, but with the weapon arm and head separate. Clothing is generic early medieval / Dark Ages, and consists of tunic and trousers, with shoes. Each figure is dressed and posed differently, immediately giving plenty of variation. 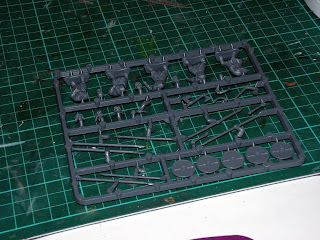 Each sprue has seven different heads on it, all different, with varying expressions and hair. Bald, short haired, long haired, bearded and moustachioed, with one wearing a hat, these give tons of variety. 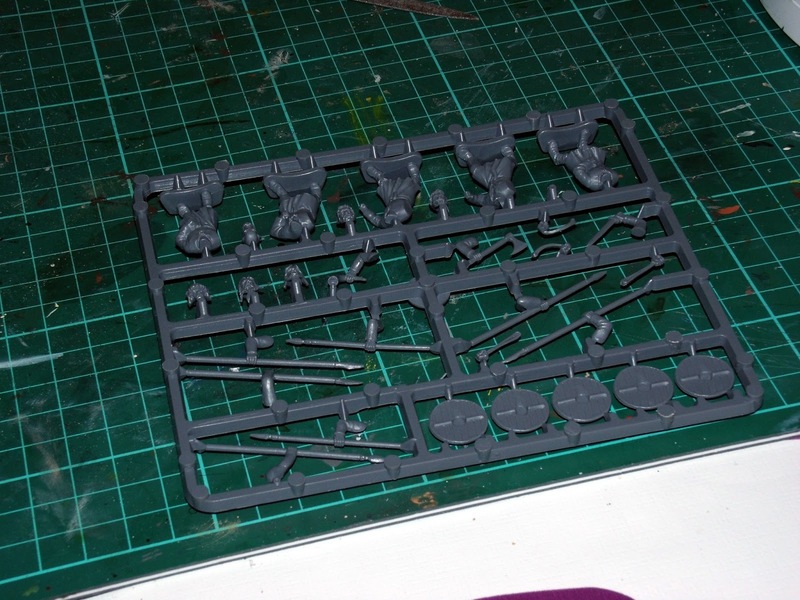 The sprue carries five arms holding spears. Eminently reasonable as the main weapon of men of this type and class would be the spear. In addition, you get two arms holding javelins and one each with axe, sword and horn. Then, there are three right hands holding slings. Cut away the existing hand and glue one of these in place, to provide missile troops. Finally, each sprue has five round shields. 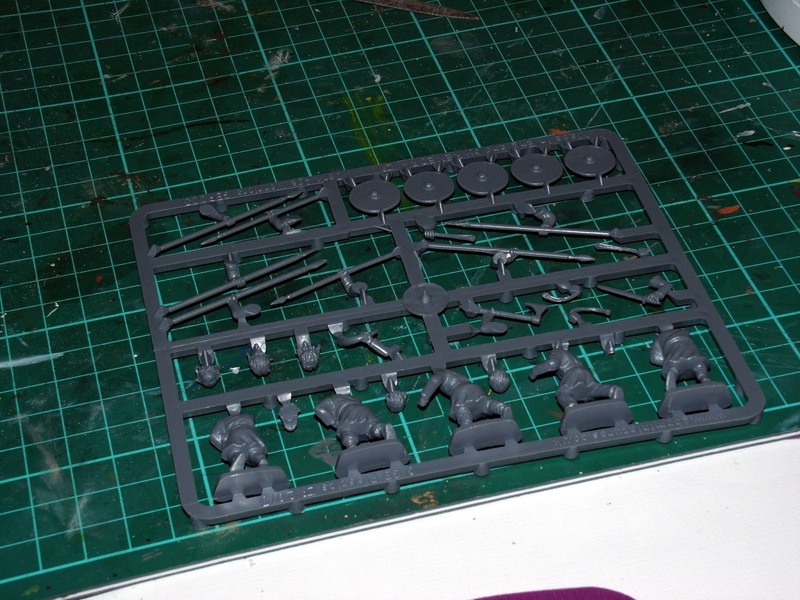 Also in the box is a sprue of 20mm plastic bases. Moulding is first-class. The detail is crisp, sharp and quite deeply cut. It's easy to remove the parts from the sprue with a set of cutters, and then a quick scrape removes all traces of the minimal mould seams. Assembly is quick and simple with liquid cement, which leaves no gaps. I cut out, cleaned up and assembled five figures in half an hour. I've spent longer than that cleaning up five metal figures any number of times! You have to put a couple of gripes into a review - it's in a set of regulations somewhere, because otherwise people think you haven't looked properly. So, here goes. 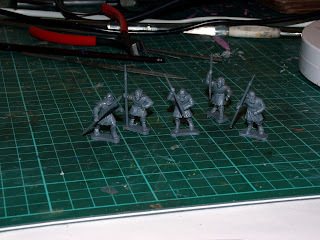 No scabbards for the swords, although a bit of plastic card and green stuff will soon remedy this. One head without facial hair would have been nice, to allow you to model some Sub-Romans, but West Wind's separate metal heads fit perfectly and will easily serve to provide not only this but helmeted heads if you want to portray a slightly better class of warrior. Bottom line? I love them and would recommend them without reservation. Twenty quid for forty figures as good as this is a no-brainer. 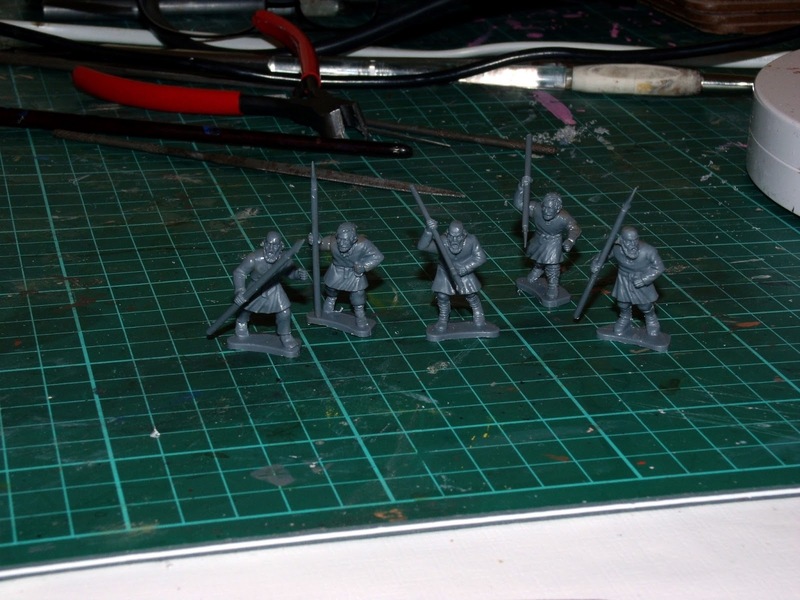 A Sub-Roman Dux Brit warband less characters and elite needs 18 levy, 12 warriors and 4 missile troops. You can get the whole lot of those out of one box and have enough figures left over to build some reinforcements (extra levy or skirmishers)! Buy some, now. You know you want to! Interesting, thanks for the précis. Ohh lovly. I just got to get me some of those. Thanks for a good review ! I was going to buy these anyway, but your review pushed them up the priority list. Excellent review, thanks. Looking forwards to getting some myself.